The graded reflectivity mirror (GRM) (also known as the variable reflectivity, Gaussian, or super-Gaussian mirror) is a special mirror whose reflectivity at a particular wavelength varies gradually as a function of the position on the mirror's surface. GRM provides a better modal discrimination in an unstable resonator, i.e. it favors the oscillation of the fundamental mode against higher order modes. It also improves the optical quality of the output beam especially at low magnifications. 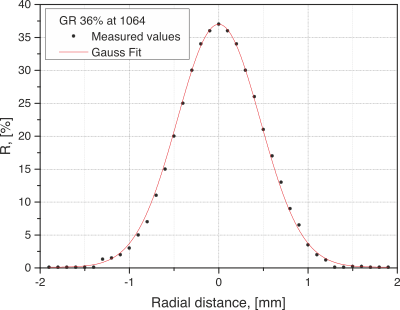 The tapered reflectivity profile also leads to a decrease of ripples in the field profile and thus reduces the risk of optical damage when used with high intensity lasers. where R0 is the central reflectivity, r is the distance from the mirror's centre, w0 is the radius of the reflecting area where R≥R0/e2, and n designates the order of the (super-)Gaussian profile. 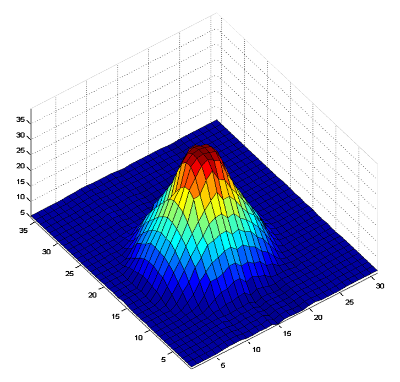 Example of GRM with R0= 36%, w0 = 0.9 mm, n = 3 at λ0=1064 nm.